Occupying a conspicuous position among the highly respected citizens of Greenville, Jonathan Seaman is numbered among the sound business men who are contributing so much toward the city's reputation as a desirable place of residence, both in a social and a financial point of view. A native of Bond county, he was born October 5, 1851, near Greenville, where his father, the late Jonathan Seaman, Sr., settled on coming to Illinois to live. His grandfather, Jonah Seaman, resided in Frederick county, Virginia, which was a slave state. He was not a slave owner, and as he had very decided views on the slave question, being, in fact, a "black abolitionist, ' ' he moved with his family to Ohio in the very early part of the eighteenth century, and there reared his sons to a sturdy manhood. Born in Frederick county, Virginia, January 22, 1799, Jonathan Seaman, Sr., was a young man when his parents migrated to Ohio, where he assisted his father in clearing and improving a farm. 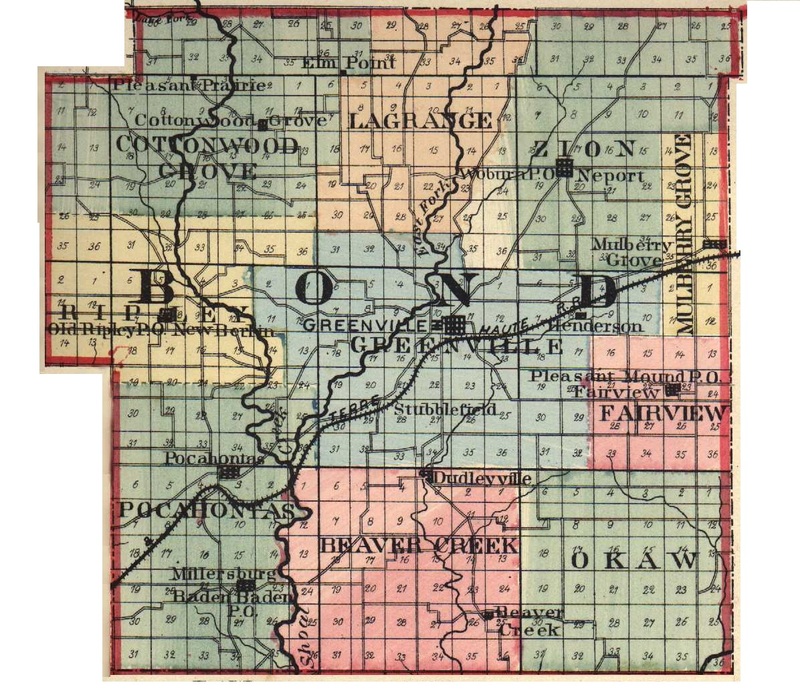 In March, 1851, accompanied by his wife and children, he came to Illinois, locating in Bond county in September of that year. Taking up land lying two miles east of Greenville, in Hall's Grove, on the homestead which he improved, he spent his remaining days, passing away January 13, 1868. He was a member of the Methodist Episcopal church, and having inherited to a marked degree the political views of his father, was opposed to slavery in any form, and was a stanch and loyal member of the Republican party from the time of its formation. He was twice married. He married first, when about twenty-four years old, in Xenia, Ohio, Sarah E. Smith, who died in 1846, leaving nine children. He married in 1848 Mary N. Miller, a daughter of Thomas and Jane Miller, of Ohio, where her father was a cabinet maker for many years. She survived him four years, her death occurring September 30, 1872. Five children were born of his second marriage, of whom Jonathan, the subject of this sketch, was the second child, and one of these five children is deceased. Brought up on the home farm, Jonathan Seaman attended the district schools of Hall's Grove, and was there actively engaged in agricultural pursuits for many years. About a month after the death of his first wife who was Mary E. Owen, of Wilmot, Wisconsin, where they were married December 15, 1874. She died September 22, 1880, and the one child by this marriage, Albert Owen Seaman, is Captain of the Fifteenth Infantry, U. S. A. Mr. Seaman, on October 23, 1880, moved to Greenville, and for a year was engaged in the drug business with his brother, George W. Seaman. Buying out the mercantile interests of Ellhart & Guller in February, 1882, Mr. Seaman has since carried on an extensive and profitable business as a hardware merchant, having a wide trade in Greenville and vicinity. He is one of the directors of the Bradford State Bank, and likewise of the Greenville Public Library. Mr. Seaman married, in 1883, Jennie H. Hull, a daughter of John Hull, of Bond county, and they have one child, J. Ralph Seaman. Identified in politics with the Prohibition party, Mr. Seaman has taken a prominent part in the management of municipal affairs, having served the city as mayor four years; as alderman six, years; and having been a school director many terms. He is a valued member of the Methodist Episcopal church, and is now serving as president of its Board of Trustees. Fraternally Mr. Seaman is a member of the Ancient Free and Accepted Order of Masons and of the Knights of Pythias. Extracted 10 Nov 2018 by Norma Hass from 1912 History of Southern Illinois, by George W. Smith, volume 3, pages 1146-1147.